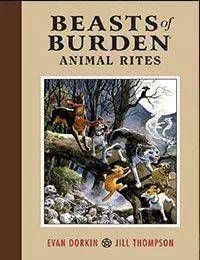 Beasts of Burden is a fun-filled adventure story that features a heroic group of dogs-and one cat-who are set with the task of keeping the residents of Burden Hill safe from supernatural occurrences. Early experiences with the paranormal have set up Pugs, Red, Whitey, Ace, and the Orphan to become members of the Wise Dog Society, official animal agents to aid those with odd concerns. Following a slew of magical frogs, encountering hostile ghosts, setting off to rescue an old friend from a sewer filled with some very large rats, and discovering buried secrets in the local cemetery are all in a days work for this new team of unlikely heroes. This hardcover includes the original stories from the Dark Horse Book of . . . anthologies, plus the all-new series from this award-winning team.